IMF Says Barbados Insurance Sector Needs “Tighter Regulation” – No Kidding! The chaos surrounding the Barbados financial and insurance company called CLICO is in full swing so the International Monetary Fund – IMF – feels obliged to tell us that our insurance industry needs “tighter regulation”. (Hey, thanks for the tip IMF! We’d have never known without you.) Next the IMF will be telling us to take a closer look at Sir Allen Stanford. 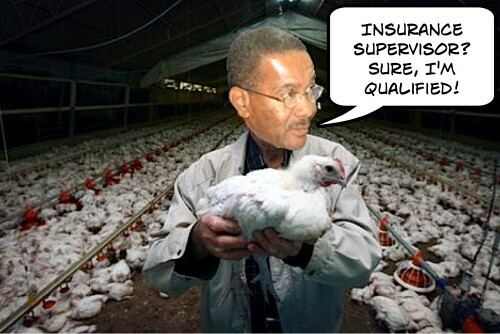 Perhaps if the IMF staff could have torn themselves away from their duck pate and champagne back in 2007 they would have seen that Carlos Belgrave, Barbados Supervisor of Insurance and Pensions, was named “Worst Regulator” by OffshoreAlert. Apparently OffshoreAlert was most impressed by Belgrave’s staunch support of three Barbados insurance companies that faked their books and had owners previously convicted of fraud. Not to mention that Belgrave approved and licensed the companies when other countries had turned them down. IMF Report Talks Of Potential For Bank Failure In Barbados? Our friends over at Barbados Money Laundering Advisory have published an excellent article about the IMF and Offshore Alert reports AND they seem to think that the IMF report also talks about another potential failure of a Barbados bank. Scary times we are living in. KYC – Know Your Client – is an investigative organisation dedicated to exposing financial crime wherever it is found. OffshoreAlert! is one of its newsletters. The organisation is run by journalist David Marchant out of Miami, Florida. Marchant has an impressive track record and was even kicked out of Bermuda by the government of the day in retaliation for his work. Somehow, I don’t think that Mr. Marchant would be made too welcome by the Barbados government either! OffshoreAlert had occasion to investigate three Barbados insurers in 2006, namely Strategy Insurance Limited, Reliant Insurance SCC and River Reinsurance Limited. The first two are part of a Canada-based group whose insiders have included three people convicted of fraud-related offenses, while the third, which has a business relationship with the Canada group, is partly-owned by two Bermuda-based businessmen who are currently under investigation for securities fraud in the United States and only sought an insurance license in Barbados after being turned down in Bermuda. If all that was not warning enough for Belgrave, Strategy Insurance Limited’s parent, which trades as a penny stock in the United States, disclosed that the insurer had been carrying 104 million of non-existent capital on its books for 11 months. The capital had once existed, according to the firm, but it was allegedly illegally transferred out of the company by unnamed shareholders, rendering the entire group insolvent. Instead of pulling Reliant’s license and despite there being no change of control or management, Belgrave allowed Reliant to continue in business by approving replacement capital with a face value of $518 million that consisted of nothing more substantial than a loan note issued by a newly-formed Panama firm that was secured by “bearer peat certificates representing the right to obtain peat, a pre-coal state organic material used as energy or for horticultural use, from the Changuinola Peat Deposit of Northwestern Panama”. When OffshoreAlert contacted Belgrave, he farcically claimed that he was legally prohibited from even having a general discussion about the Barbados Insurance Act, let commenting on individual companies. Belgrave declined to impart any information about his professional background and qualifications so we did our own research and found that, prior to being appointed to his regulatory position, Belgrave was the General Manager of a local company that manufactures “flour, animal and poultry feeds”, according to its promotional material. When we found out that Belgrave is currently the ‘Third Vice-President’ of the U.S.-based International Association of Insurance Fraud Agencies Inc., we didn’t know whether to laugh or cry. The oil industry created the practice of countries (SHIPS?) flying “flags of convenience” as a means of avoiding income taxes nearly a century ago. Since the 1960s the U.S. Government itself has encouraged American banks to set up branches in Caribbean hot-money centers and more distant islands as a means of attracting foreign money into the dollar. The initial aim was to help finance the Vietnam War by turning America into a new Switzerland for the world’s hot money. This policy succeeded in turning the United States into a flight-capital center for third-world dictators, Mexican presidents and Russian oligarchs. The former Soviet Union now finances a substantial portion of the U.S. balance-of-payments deficit with the flight capital that neoliberal “reformers” facilitated by backing the kleptocrats. The result has grown into a full-blown system enabling multinational corporations to evade taxes everywhere, including the United States itself. It enables domestic investors to globalize their operations by setting up offshore affiliates Enron-style in the Cayman Islands, Dutch West Indies or some small and newly notorious Pacific Island of their choice. Priceless! Not just that we have blogs to out this information not reported anywhere else locally but, more specifically to this issue, we now have a regulator that should be ashamed to show his face anywhere publicly in Barbados. How on earth could a yahoo like him be appointed to such a position?!?! There are so many things that you can say about this story but the first thing that comes to mind is who appointed him to the position? Was it because of political connections? This reminds me of Michael Browne of Hurricane Katrina fame who was appointed to manage FEMA without the requisite skills. Remember what George W Bush said to him after New Orleans was under water and the snail like pace in which FEMA responded to the crisis “ Brownie you’re doing a heck of a job”. Mr. Belgrave has served under two different administrations. Maybe both parties are either happy with his performance or “asleep at the wheel”. I think asleep as the wheel is more apt. We’re going to be the laughing stock cause this is out there on the net. (d)with surpluses on balances of payments. Had not for them, this country would be in the hip-pocket of the IMF. The DLP talks about social policy to hide its total incompetence on the economy. Whereas the BLP transforms the entire society, the DLP is only relevant when it keeps people poor. Did it ever occur to anyone that the reason he was appointed is because the powers that did so, didn’t want a competent knowledgeable man at the helm. He might actually do his job and then their friends can’t pull their scams. Building up a strong well capitalized and well run insurance company was not what they were looking for. I LOVE the photo cartoon BFP. Gawd! Welcome to Barbados, international offshore banking and re-insurance center! The man be expert on chicken poop and bonds that get repaid by peat. Our insurance industry be backed up by poop and peat. We be laughing stock of the whole world now. He can’t do much worse than the Land Surveyor, Chief Agricultural Officer and CEO ex-Cable & Wireless employee running the sea island cotton co. that was supposed to be bringing in major foreign exchange by now. Instead, the taxpayers still supporting them. Unfortunately, there are a lot of unsuitable, unqualified, inexperienced jackasses in these senior positions. I am hyperventilating at the photo of our dear Carlos on the day he was appointed to be Supervisor of Insurance. Oh, the joy of baseless comments. Let me see. 1997. Duck pate? Champagne? Asian financial crisis. Don’t remember seeing any of that fine stuff. That must have been when some us were trying to help shore up Russia and an impending ruble crisis. Did they really spend US$25 billion to try to defend the currency? Should have told them Ruskie not to go fighting in Checnya. Ooops. The phone line was jammed, I remember, and bugged. Oh, the joy of freezing in Moscow with no heating. I guess the good stuff was in the 3 feet of snow we had to trudge through in the streets. Or maybe it was because we were in Entebbe trying to show the Ugandans that the foreign reserves they had on paper were just book entries and no real money. Oops! Nice Indian food in Kampala though, but no electricity at night to eat by. And coming home with a dose of malaria and thypoid fever. Ah, life’s luxury. Maybe the IMF should takes some journalists on mission and see if they enjoy the 18 hour days for two weeks in a foreign country. The pate and champagne must still be in the mail. Come on people, are we saying that this is a special or unusual situation? THIS IS THE NORM HERE. In fact I am challenging BFP to seek out and identify any COMPETENT, EFFECTIVE, PRODUCTIVE and HONEST national leader who could stand the scrutiny of these blogs…. …we can leave out the politicians – lost cause. Let’s see – Chief Justice? DPP? Town Planner? CTO? any of the senior Civil servants? Police Leaders? Army leaders? Utilities? Business? Even Church? …. Which one? Until we start to deal with this foolishness seriously, we will soon reach the stage where the whole national psyche will be crooked, and the few honest ones left will become the freaks…. …and clearly we CANNOT depend on our leaders to fix the problem. THEY TOO ARE CROOKED. This is why Belgrave was appointed….and why no one has been so far charged for the thievery of the last 10 years. He was not even a good manager at the feed plant…. Oh dear Bush Tea hit the nail on the head. There are a few honest brokers but they are already outspoken, in their senior years and don’t care what the repercussions are or they are too smart to raise their heads and become victimized by the corrupt. Nevertheless there must be some and BFP might be able to elevate those to national consciousness? When your child then says to you that they not worrying to learn at school or continue on to University, what can you say to them, when so many jackasses are promoted to high places in Barbados, and those with any competence are looked over? …..problem is that ‘those with competence’ are looked over because they tend to ask difficult questions of the crooks above them. They are then bad talked, sidelined or dismissed, o that the status quo is not disturbed. This situation can ONLY be changed when an honest man with GUTS gets the very TOP position, and sets the standards from the very top. Well whatever really happened in 2007, besides my coming to Barbados, got a sharp twist in 2008 when about 500 IMF staff (about 20%) decided to leave voluntarily as a cost cutting exercise (see FT report). Now some of us can enjoy pate and champagne and enjoy the sun and sea. army leaders(?). You mean like the commandant of the cadet corps? Don’t blame the incompetents who get put into the job. Them looking out for themselves. Blame the people who hire them to do it. If you en working, or perhaps working for lil bit, and a fellow offer you a big job for plenty money, wouldn’t you take it, knowing full well that you cannot get it done. The fellow at cotton – knows nothing about manufacturing, design, fashion, marketing, never see a cotton plant in he life, but he getting 10 grand a month. Even if he can only keep the job for a couple of years, he still coming out on top. And there are many more like him who getting big money and don’t know what the hell they doing. You’all have a problem with that? BFP dd you check the guys qualifications? He was Manager at Barbados Mills of which Feeds and Super Poultry was a part of the group. He was therefore managing a group of businesses…you cant be too shody to do that. As Supervisor of Insurance he relies on the informed opinion of the islands audit firms which I believe in most cases have to give their opinions on the financial records of all insurance companies both local and offshore before he or his staff gets to even look at them. So maybe like I have said before, maybe we need to look at the first cog in the financial regulators wheels, the auditors, the accountants, the bankers. LOL the same BS artists who were quick to jump on Radio programmes and instill crap into the minds of BPF and the general public. These people garner healthy audit and general professional fees from local and offshore insurance companies and need to keep garnering them. They regulate themselves, just like lawyers, doctors and engineers (Arch Cot?) So why not turn a blind eye to bad assets…I will still get my US$30 fee, even if teh company has a cash flow problem. Anybody remember Trade Confirmers? A well know audit firm issued them with a clean audit report. As usual BPF is leading the public on a right merry-go-around looking for the wrong bad guys. Poor Mr Belgrave may be the least of our problems! That story from Offshore Alert was sent to BFP on the day it was published way back when…..strange how it only got the attention of this blog now…. Optimist Prime (aka Clyde Mascoll) you still looking for praise for your dishonesty? Man wunna like to destroy people’s reputations on this blog. I notice on this blog that under the pretence of finding out the truth you try to tarnish persons’ characters. Shame,shame,shame. BFP, what would you consider the qualifications for a Supervisor of Insurance? 1/ Experience at a senior level in the international insurance business. 2/ A successful track record in forensic audits with appropriate education and certifications prior to taking the job. 3/ Enough common sense and integrity that you wouldn’t approve a company run by fraudsters, or consider options to mine peat moss as sufficient to meet the regulatory requirements! Tarnish peoples reputations? You mean Mr. Belgrave has previous experience that would qualify him? You mean he didn’t approve those insurance companies that were run by fraudmen? Pingback: » Is “Weak” CLICO Barbados Subsidiary Bankrolling Trinidad HQ? Keltruth Corp.: News Blog of Keltruth Corp. - Miami, Florida, USA. My understanding is that Carlos Belgrave formerly worked with the Management Accounting Department of the Ministry of Finance and Economic Affairs (MFE). It would not however surprise me that he also farmed turkeys – he has certainly supervised quite a few, apart from CLICO! His predecessor, Ian Carrington, was equally incompetent, but got a nice sinecure in the NIS. I have had some involvement with insurance regulation in the Caribbean and it stinks, with a few exceptions. The sector is widely populated by unqualified self-important goons, whereas the banking sector at least gives some semblance of capability. The ECCB has taked for years about upgrading supervisory standards, and well-meaning bodies like the IMF and CARTAC pretend they are helping the cause, whereas they are just perpetuating incompetence. The IMF has to insist on the majority of Caribbean regulators being removed from their position, and get governments to hire competent people. He is one of the worst boss anyone could have come across.